This agreement can be used in any situation where the lender does not require or is willing to forgo security in case of default. An unsecured loan is used when the lender is confident that the borrower will repay. The main reasons to record the terms in a document are to prevent a disagreement later, and to allow the lender to seek recourse if the loan is not repaid. If you are a director or shareholder, lending to or borrowing from your company, then a written agreement will ensure the arrangement is clear to other directors, shareholders and HMRC. 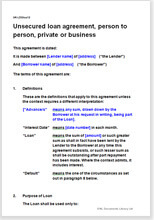 The purpose of the loan does not affect the terms of the agreement. You could be lending a friend money for short-term expenses, such as wedding costs, or to a business on a longer term. Drawn outside the Consumer Credit Act 1974, this agreement is not suitable for companies in the business of lending or providing credit to consumers.